We can't stop the future from arriving, no matter what drugs we're on. But even if nearly every part of us becomes robotic, mechanical fingers crossed we'll still have our minds. Hopefully we'll use them for things like compassion, instead of just chasing what's 'better' like a hamster on a wheel. If we can do that, we're on the yellow brick road to happiness. With a little help from monk Gelong Thubten, who explains how the mind works, and neuroscientist Ash Ranpura who explains where everything that makes us 'us' can be found in the brain. How to be Human is the show you need to help you upgrade your mind as much as you've upgraded your iPhone. This is the follow up to Ruby's sell out shows ?Sane New World' and 'Frazzled'. Between 25th April 2019 and 30th November 2019 this tour will visit 31 venues in Colchester, Belfast, Brighton, Derby, Salford, Inner London, Westcliff-on-Sea, Outer London, Swindon, Birmingham, St Albans, Aldershot, Ipswich, New Brighton, Aberystwyth, Crawley, Harrogate, Leeds, Sheffield, Whitley Bay, High Wycombe, Bishops Stortford, Swansea, Carmarthen, Dorking, Telford, Northampton, Westcliff-on-Sea, Crewe, Folkestone and Salisbury. Current and future dates only. This production has already been seen in 4 venues since 29th September 2018. You can embed this tour information on your own website by adding a single line of code to a page and using the Qtix code T332812216 - for details see our Embed Information page. 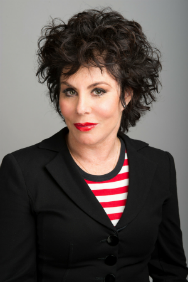 Receive email notifications of changes to Ruby Wax - How to be Human.